Median gross weekly pay in Scotland in 2007 was £360.20. This had risen to £396.10 by 2012. 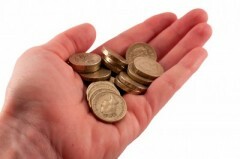 If it had increased in line with inflation, it would be £423.22 by 2012. A worker earning median pay (exactly halfway along the income distribution – half earning more, half earning less), is therefore 6.4% or £27.12 a week and £1410.24 a year worse off. Then we look at inflation. 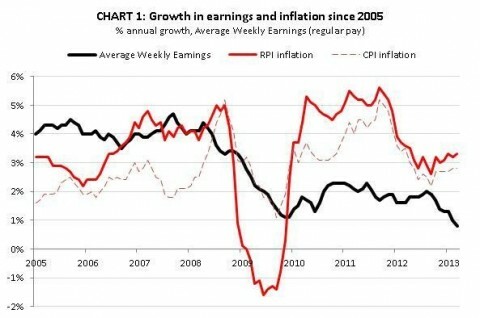 This table shows how wages and inflation used to rub along together. That changed dramatically in 2010, narrowed slightly and is now growing apart again. We also need to dig a bit deeper into the inflation numbers. The headline figure is bad enough, but it is much more challenging for low paid workers when essential items are rising even faster than the headline rate. This table illustrates the point. And the final individual pressure – the combined impact of tax and benefit changes will mean a 1% drop in income for the bottom 30% of households and 2% for households with one earner and two children. To all of this I would add the wage/productivity gap. We only have decent figures for manufacturing, but with 51,700 job losses in the Scottish public sector since the crash and a pay freeze – it won’t look that much different. When you consider this chart you can see that the productivity gains are not going into wages. This means we are back to the uncertain world of trickledown economics. 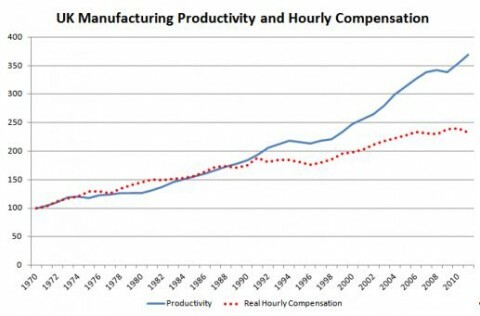 The consequence of all this is a vicious circle: productivity doesn’t feed through to wages; this holds back household incomes, which stunts demand, which leads to lower investment, which could lead to slower improvements in productivity. It is also important to local economies. The low paid spend more of their disposable income locally and therefore real wage cuts contribute to the lack of consumer confidence on the High Street. One of the reasons we are in the longest and deepest recessions in a generation. How is this avalanche of cuts really hitting the poor? Posted in: Earnings, Economy, Macroeconomics, Trade Unions. Do Labour whips really want to run its conference too?